It’s not just the bow ties they had in common; it’s the air of civility. 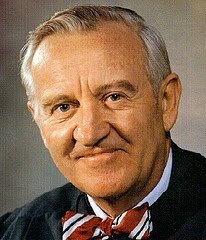 Yesterday U.S. Supreme Court Justice John Paul Stevens announced that he will retire from the nation’s highest bench. Within the same 24-hour period, former Massachusetts House Minority Leader Frank Hatch passed away. Both left an imprint on the institutions with which they were associated, and both had a style that is sorely missed today in the realm of public affairs. I covered Frank Hatch at the State House in the 1970’s. He was all about reasoned discourse and finding a consensus on issues. As then-House Speaker David Bartley said of his Republican counterpart in Gloria Negri’s column in today’s Boston Globe, Hatch was all about “integrity, decency and dignity.” He represented a noble tradition of Republicanism and thought in the Commonwealth, conservative on fiscal matters, liberal on social issues, and marked by personal grace. He was enlightened and visionary on environmental issues and bespoke a political environment where people could still disagree without being disagreeable. I see Justice Stevens as “an impartial guardian of the rule of law.” His brilliance and fair-mindedness will be missed. Following President Gerald Ford’s nomination of Stevens, confirmation took less than three weeks. Would anyone bet on that happening when President Obama makes known his choice to succeed Stevens? The Commonwealth and the nation are poorer for the death of Hatch and the stepping down of Stevens, just as we are poorer for the dominance of highly ideological leaders on both the right and left wings. Sadly today a pragmatic center is too often ignored or viewed as betrayal, and politics succeeds largely by throwing red meat to the parties’ bases. This entry was posted in Uncategorized and tagged Frank Hatch, Gloria Negri, Justice John Paul Stevens, liberal Republicans, U.S. Supreme Court. Bookmark the permalink.